The philosophies of French thinkers Derrida, Lyotard, and Foucault form the basis for postmodern thought and are seemingly at odds with the Christian faith. However, James K. A. Smith claims that their ideas have been misinterpreted and actually have a deep affinity with central Christian claims. Each chapter opens with an illustration from a recent movie and concludes with a case study considering recent developments in the church that have attempted to respond to the postmodern condition, such as the "emerging church" movement. These case studies provide a concrete picture of how postmodern ideas can influence the way Christians think and worship. This significant book, winner of a Christianity Today 2007 Book Award, avoids philosophical jargon and offers fuller explanation where needed. It is the first book in the Church and Postmodern Culture series, which provides practical applications for Christians engaged in ministry in a postmodern world. James K. A. Smith (Ph.D., Villanova University) is the Gary & Henrietta Byker Chair in Applied Reformed Theology & Worldview at Calvin College in Grand Rapids, Michigan. In addition, he is editor of Comment magazine and a senior fellow of the Colossian Forum. He is the author of Introducing Radical Orthodoxy, coeditor of Radical Orthodoxy and the Reformed Tradition, and editor of the Church and Postmodern Culture series (www.churchandpomo.org). James K.A. Smith in his book, Who's Afraid of Postmodernism? says that those who criticize postmodernism do so based upon misinterpretation of "bumper sticker" slogans, and not upon a full orbed engagement with the leading thinker of postmodernism: Derrida, Lyotard and Foucault. One could speculate on why Smith's book has not been utilized in conservative evangelical circles. Maybe it is the association with Brian McLaren and the Emergent Church. This is unfortunate because even if conservative evangelicals are not convinced of the positive role postmodernism brings to Christianity (which Smith claims), having a correct understanding of these postmodern thinkers is worth our attention. If our critiques of postmodernism is characterized by a misunderstanding or solely on "bumper sticker" slogans then we cannot honestly say we are servants of the Truth. In a Schafferian manner (20), Smith's goal is to look at postmodernism from a philosophical view and demythologize postmodernism by showing that what we commonly think so-called postmodernists are saying is usually not the case. In addition, Smith looks to "demonstrate that...all these claims have a deep affinity with central Christian claims (22)." Smith wants to move past the bumper sticker philosophy and understand the three thinkers properly. By correctly understanding them, Christians will see they can apply these ideas to the Christian faith (27). Smith understands that Christians cannot comprehensively adopt these theorists and provides critique when necessary (24). In the end, however, Smith writes, "I will argue that the postmodern church could do nothing better than be ancient, that the most powerful way to reach a postmodern world is by recovering tradition, and that the most effective means of disciples is found in liturgy...We will see that much that goes under the banner of postmodern philosophy has one eye on ancient and medieval sources and constitutes a significant recovery of premodern way of knowing, being, and doing (25)." Each chapter, broadly, follows the following outline: identifies modern/ postmodern thought from film and applies it to his discussion; overview of the philosopher; how Christians have wrongly understood the philosopher; correct interpretation of philosopher with application for the church. Smith begins with Derrida and his puzzling phrase "there is nothing outside the text." As best as I can decipher, there are five points which form Smith's overall evaluation of Derrida. 1. Interpretation is not bad; not something we need to look/ get past. 5. The Christian's confidence rest on convictional power of the Holy Spirit not on objectivity. One of the most controversial points is Smith's comments on "objective" truth. Smith suggests that the reason Christians believe Derrida's ideas are antithetical to the Christian faith is because they "conflate truth with objectively." Interacting with D.A. Carson, Smith writes, "While Carson rightly notes that human knowledge can never pretend to be omniscience, this doesn't mean we can't claim to know in a finite but real manner. But his affirmation of finite knowledge always elides into an affirmation of objective knowledge (43)." This desire for "objective" truth rather than understanding that everything needs to be interpreted, and that interpretation is "not a series of hoops we jump through to eventually reach a realm of unmediated experience where we don't have to interpret anymore (38)," is where there is a fundamental difference between Smith's reading of postmodernism compared to others. Smith finds that many Christians have bought into a Rousseauean notion that assumes interpretation is a disease that pollutes and corrupts our relationship to the world. "But the fact that something is a matter of interpretation does not mean that an interpretation cannot be true or a good interpretation (44)." To further illustrate his point, Smith takes Derrida to the cross and contrasts the interpretation of events from unbelievers perspective and then from the centurion's perspective (Matt. 27:54). Smith concludes, "Christians agree with the interpretation of the centurion...our agreement doesn't mitigate the fact that this is an interpretation (48)." Here Smith argues (rightly) that "objective provision of revelation in the Scriptures is ineffectual as revelation (i.e. to communicate) without the regeneration of the heart and mind in order to dispel blindness (48)." Where most evangelicals would find issue with Smith is his lack of clarity on the objective interpretation from a divine perspective. But I don't think this is missing from Smith's book, rather it is presupposed and possibly overlooked by Smith himself. He writes, "What is required to interpret the world well is the necessary conditions of interpretation - the right horizons of expectation and the right presuppositions (49)." In other words, what we need is divine aid (Holy Spirit) and Christian presuppositions. So Smith would have to conclude that from a divine perspective there is an objective interpretation of the events at the cross. If not, we might wonder why God needs to send His regenerative Spirit to have the centurion see the right interpretation of Jesus. Following Derrida, Smith, I believe, is challenging objectivity from a human perspective. Lyotard's claim that postmodernism is "incredulity towards metanarratives" is probably the most well known phrase of postmodernism. The fruit of Lyotard's critique of modernism based on Smith is astonishingly Christian: "The incredulity of postmodernity toward metanarratives derives from the fact that modernity denies its own commitments, renounces its faith, while at the same time never escaping it." Smith continues, "But note: the postmodern critique demands not a that modern thought relinquish its faith (a modern gesture, to be sure) but that it owns up to it - openly confess its credo (72)." In other words, postmodernism calls every worldview to be honest and lay their cards on the table, which is exactly the call of presuppositional Christian apologists. Smith's challenge of the typical Christian understanding of Lyotard begins by putting his famous phrase in context. He writes, "For Lyotard, metanarratives are a distinctly modern phenomenon: they are stories that not only tell a grand story (since even premodern and tribal stories do this) but also claim to be able to legitimate or prove the story's claim by an appeal to universal reason (65)." Therefore, it is not "the stories people tell but the way they tell them...(64)." Smith claims that Lyotard is not against narratives (like the Biblical narrative), but he is suspicious of the very idea of autonomous reason - a universal rationality without ultimate commitments (71). Smith addresses classical Christian apologists by saying, "...some might argue that the Christian faith can be legitimated by reason...classical or evidential apologists might argue that the Christan faith is grounded in reason and thus constitutes a metanarrative (68)." Thus, some Christians might rightly feel threatened by postmodernism, but Smith continues, "I would argue that classical or evidentialist apologetics would fall prey to Lyotard's critiques of metanarratives, and that such a critique would be welcomed by presuppositionalists (68)." Instead of legitimating the Christian faith from autonomous, objective, neutral rationality, Smith says, "I have argued that postmodernity represents the retrieval of a fundamentally Augustinian epistemology that is attentive to the structural necessity of faith preceding reason, believing in order to understand - trusting in order to interpret (72)." In this way, Smith demonstrates that postmodernism is actually premodern. The final philosopher Smith analyses is Foucault with his phrase "power is knowledge." Foucault is criticized heavily by Smith as more of a modern thinker than a postmodern thinker based upon his commitments to autonomy and his negative view of discipline and formation. One wonders what contributions Foucault adds to the conversation, since Smith tends to disagree with him more than the others. But we gain something from Foucault by reading him in light of Smith's critiques. Smith summarizes Foucault by saying, "So the goal of a disciplinary society, and the institutions within that society, is the formation of individuals by mechanisms of power. Society makes individuals in its own image, and the tools for such manufacturing are the disciplines of power (90)." Later he writes, "The disciplinary society forms individuals into what it wants them to be: docile, productive consumers who are obedient to the state (92)." In criticizing Foucault Smith writes, "The critical point is that Foucault is absolutely right in his analysis of the way in which mechanisms of discipline serve to form individuals, but his is wrong to cast all such discipline and formation in a negative light. In other words, Christians should understand discipline positively...Christians should eschew the very notion of an autonomous agent who resist any form of control (99)." Smith uses the final chapter of the book to apply the insights of Derrida, Lyotard, and Foucault to the church. In particular he seeks to apply these principles to the Radical Orthodoxy movement with also an eye on the Emergent Church. To many of those on the conservative end of evangelicalism, they would be surprised that Smith is often critical of those in the emergent church movement (117, 121, 123, 130), especially as it pertains to what Smith calls "religion of non-religion." Many of Smith's applications are helpful. However, I did feel that his criticism of the Baptist tradition was not nuanced enough (128-129). Many of those in the historic baptist tradition embrace the historic confessions proudly. Baptists gained a reputation as rejecting confessions and creeds through the influence of fundamentalism and liberalism in the baptist tradition. 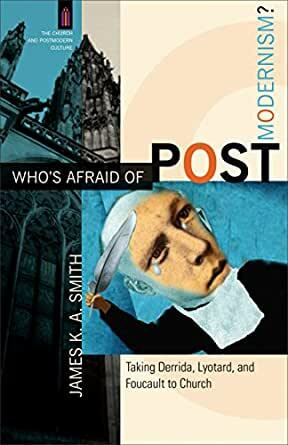 Smith makes many convincing arguments that postmodernism is in many ways premodern, but he is clear that this is not simply a call backwards. He writes, "...it was a nonidentical repetition of the tradition in a postmodern context. It was not a nostalgic, romantic return to old paths. This was a creative retrieval of the tradition for a postmodern culture (127)." Many conservative evangelicals will appreciate Smith's call for the church to be bold: "Theology is most persistently postmodern when it rejects a lingering correlational false humility and instead speaks unapologetically from the primacy of Christian revelation and the church's confessional language (126)." I believe many evangelicals will find Smith helpful. If nothing else, it will provide the reader with nuance as they seek to critique postmodernism. However, don't be surprised if many of your critiques are humbly absent next time you discuss postmodernism. In many ways what Smith is arguing for is found in much of Tim Keller's work. The wrong posture towards the book would be to dismiss it by association (guilt by association = fundamentalist fallacy), not upon the content. Probably the best aspects of Smith’s book were his clear explanations of the three Parisians. He writes in an understandable way even for those not versed in philosophical jargon. Another aspect that was strong was his extensive use of footnotes which provided some useful elaboration in places as well as opportunities for deeper study. I might add a third. His prescriptions for the contemporary church’s response to post-modernism, but I think my enjoyment of this was based more in my personal affinity for his ideas than the strength of the arguments he is able to draw between the post-modern ideas and how the church should incorporate/respond. There are some cutting critiques of the contemporary church, particularly on its thoroughgoing embrace of modernism. Side note: One technique he uses in this book is anchoring the theme of his major chapters in a particular film. I felt this was a bit of a stretch a few times, but overall I think he used it helpfully. He seemed unclear in this rhetorical strategy as to whether he wanted to use the films almost as allegories or as examples of the ideas in contemporary art. I think he should have leaned a bit more toward the latter. 4.0 out of 5 starsGood detailed overview. This book is exactly as described, reviewing the influence of three French philosophers on post-modernism. I really appreciated the perspective and contribution. As a non-philosopher I did find some of the discussion a little heady and too detailed, even though the author specifically claimed he was not going to do so. I also did not agree with the authors conclusions, as they were typical ancient-future rehash, which is not at all what I am seeing in actual churches that are reaching post-moderns. I would recommend this as a good read for those Christians who are interested in a primer in post-modernism, and engaging in thinking about how to connect with them.